Promoted by Satterley Property Group. Forrestfield is located close to major industrial employment centres and only 15 km from the Perth CBD in Western Australia. It is also close to the expanding Airport precinct that provides retail amenity and an employment centre (outside of the airport noise zone). The Hales estate in Forrestfield is your opportunity to invest in this growing region. Located 15 km from south-east of PerthPerth, TAS Perth, WA, in the State Government's eastern growth corridor, Forrestfield offers residents education, employment, retail and recreation opportunities. Forrestfield has direct access to major roads including Roe Highway and Tonkin Highway, as well as Transperth buses servicing the area. Significant investment into the area by the State Government has resulted in several major projects. Some of these include the Forrestfield Airport Link comprising three new train stations, new DFO Perth and the first Costco in Western Australia. This will continueto support and drive the residential market within the area. The Hales Estate in Forrestfield is well located with numerous amenities in close proximity. The area is home to significant open space and outdoor recreation, including Lesmurdie Falls and the surrounding nature trails. The Hales estate is providing importunities for new housing in the well-established Forrestfield area. It is home to 10 parks, two playgrounds and other recreational facilities. Forrestfield residents have access to several education facilities. Major schools include Forrestfield Primary School, Dawson Park Primary School and two private schools including Heritage College HillsideHillside, VIC Hillside, VIC Christian College. 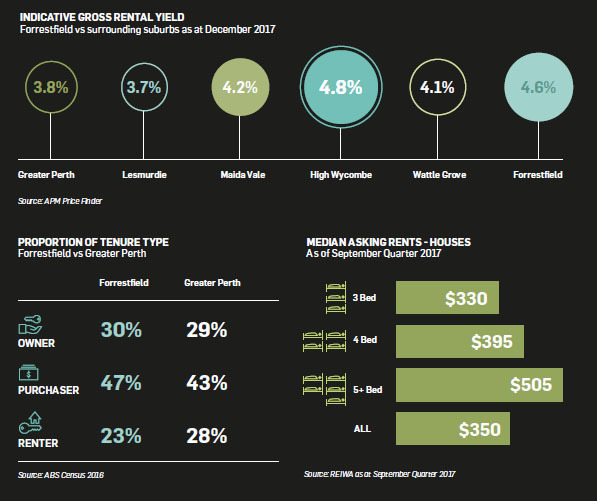 As growth within the region is supported by strong infrastructure investment, education and lifestyle drivers it is expected that demand for residential product will continue. Forrestfield is bounded by the Darling Scarp and the southern end of the Perth Airport. The suburb is bordered by Wattle GroveWattle Grove, NSW Wattle Grove, WA, High Wycombe, Maida Vale and Kalamunda. Buying at The Hales is a smart move for those ready to hit the ground running with existing amenities such as schools, shops and transport already in place and heavy investment already underway for future infrastructure. 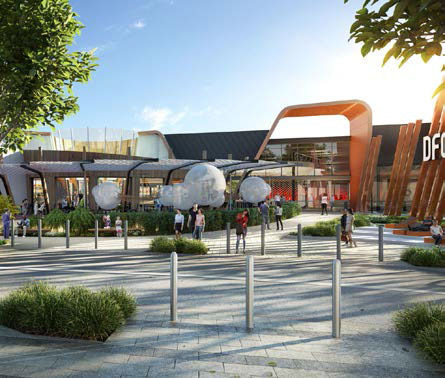 With three new train stations being constructed at RedcliffeRedcliffe, WA Redcliffe, QLD, Airport Central and Forrestfield, the project aims to connect the eastern suburbs of Perth to the CBD and wider Perth. Forrestfield Train StationThe new station currently under construction is due to open in 2020 and will only be a 20 minute journey to the CBD. There is ample parking proposed with space for up to 2,500 cars. The proposed, Forrestfield Train Station is located only 2.4 km from The Hales estate. It will stop at the future Airport Central and Redcliffe Train Station, providing easy access to the new DFO and Costco as well as Perth Airport. The first premium Outlet Centre in Western Australia is expected to be completed at the end of 2018. It is located close within the Perth Airport close to the new Redcliffe Train Station. The centre will feature over 110 fashion outletstores as well as food and beverage outlets. To support visitors, the centre is also set to provide a playground, outdoor seating and parking for more than 1,500 cars. 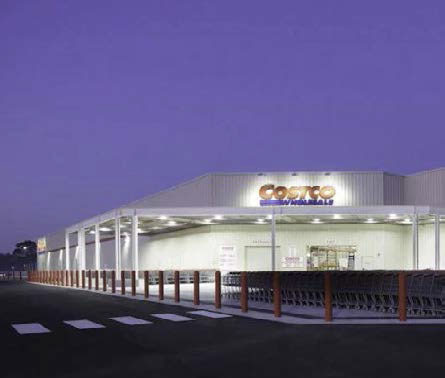 Situated adjacent to DFO in the Perth Airport is the site of the first Costco in Western Australia. It will entail 14,000 sq.m of building area and will include and Optical Centre, Tyre Centre and petrol station, to name a few. The Halesis just an 11 minute drive. It is set to open in2020. Construction is expected to generate 200jobs, with a further 275 new jobs available once operational. The centre has recently been refurbished and has a range of specialty stores, dining options, and a children’s playground. Characterised by its lifestyle and educational amenity, Forrestfield is a fast-growing suburb in Perth’s East. With the surrounding infrastructure projects planned, it is expected the residential market within Forrestfield will continue to strengthen. 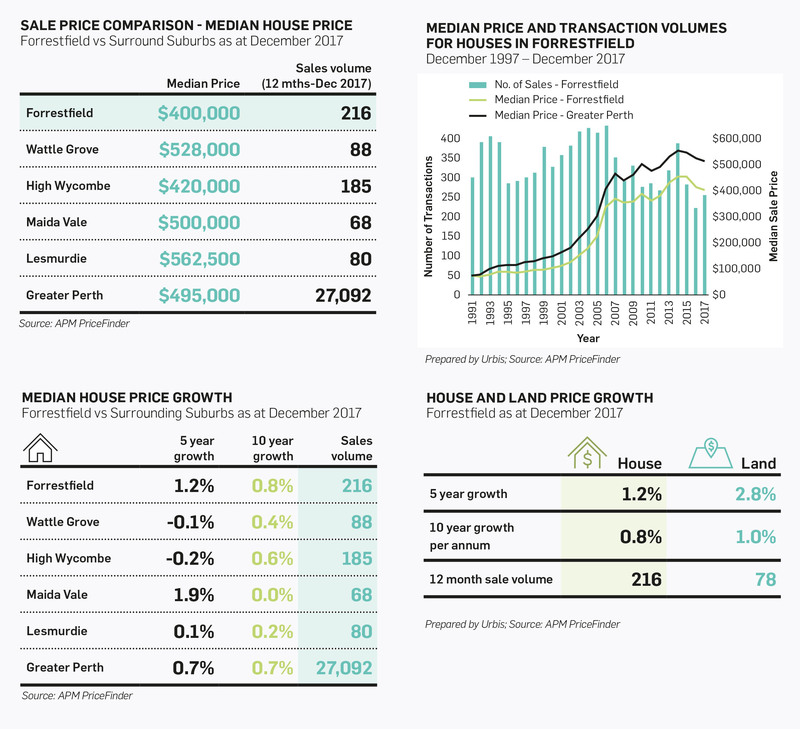 Forrestfield has historically performed well, registering a compound median house price growth of 7 per cent per annum over the past 20 years. The median house price in Greater Perth is currently $495,000. The recent softening in the market brought greater affordability to Forrestfield with the median house price being $400,000 for the December quarter in 2017, based on 216 transactions. Forrestfield is one of Perth’s middle ring suburbs and offers affordable housing options in comparison to neighbouring suburbs. There is potential price growth opportunities over time. New monthly dwelling approvals in January 2018 reached an all-time high since 2015. During 2016 and 2017, dwelling approvals grew by 20 per cent in the Forrestfield- Wattle Grove SA2 area, with a total of 873 house approvals and 110 ‘other residential’ approvals, largely semi-detached and units. This considerable boom in residential product is reflective of the area’s strong residential market and is expected to be met with similar demand from the region’s population growth moving forward.